The dream for an apex body of Monpa tribe residing in West Kameng and Tawang districts of Arunachal was finally realised today with the formation of ‘Monpa Mimang Tshokpa’ . In the first general conference of ‘Monpa Mimang Tshokpa’ (MMT) chaired by Chief Minister Pema Khandu here at Kalawangpo Convention Hall, about 500 delegates from Monpa tribe of the two districts unanimously adopted the constitution and bye-laws of the organisation – bringing the whole tribe under one platform. 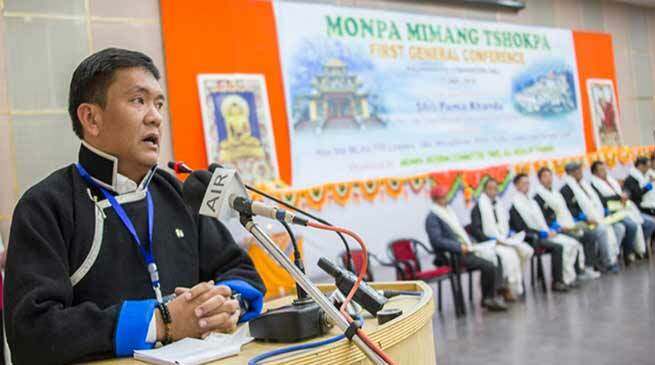 “The desire to have a common platform for all Monpa people was first felt in 2009 by former CM late Dorjee Khandu and late TG Rinpoche”, Khandu said in his address during the conference. He congratulated the Monpa society and the newly selected MMT President, Rinchin Dorjee and MMT Secretary General TT Dirkhipa and all other members of the central executive committee (CEC) of the ‘Tshokpa’ for the dream to have been finally fulfilled. “Besides working for upliftment of Monpa people, the apex body will help them to reach out to other tribes in Arunachal building bridges for peaceful and cordial relation,” said Khandu. Extending greetings to all other communities in Arunachal on behalf of ‘Tshokpa’, the Chief Minister said the Monpa apex body will also work along with other tribal apex bodies in the state for spreading communal harmony and to generate feeling of brotherhood. Underlining the importance of community apex bodies in culturally diverse states like Arunachal, Khandu said the apex bodies have helped resolved conflicts between tribes by giving opportunities for dialogues and bridging the differences. He said the apex bodies in Arunachal have also strengthened peaceful co-existence and harmony between tribes. To strengthen cultural harmony within the Monpa tribe, the Chief Minister emphasised on use of Bhodi as a common language in the tribe that speaks more than three different dialects – incomprehensible to each other. Khandu thanked former Chief Minister Nabam Tuki under whose tenure, the state government had assured to create about 100 posts of Bodhi teacher to teach the language. Earlier RWD Parliamentary Secretary Jambey Tashi urged the apex body to adopt good practices followed in other communities and to forge relations to learn from each other. Health Parliamentary Secretary Phurpa Tsering urged that to bring oneness among Monpas, he emphasized on language exchange programs between Monpas of Tawang, Dirang and Kalaktang. Besides daylong discussion on roles and objectives of the apex body, the conference felicitated DIG PN Khrimey and SSB DIG Sonam Yudron.